This article is about the market town in Surrey. For other uses, see Dorking (disambiguation). 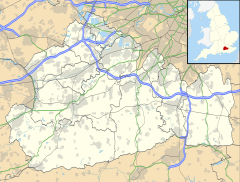 Dorking /ˈdɔːr.kɪŋ/ is a market town in Surrey, England between Ranmore Common in the North Downs range of hills and Leith Hill in the Greensand Ridge, centred 21 miles (34 km) from London. In the Georgian and Victorian periods six prominent sites in the former parish or on its boundaries became grand country estates: Leith Hill Place, Denbies (today a vineyard/hotel), Norbury Park, Polesden Lacey, Wotton House and Deepdene; five of which along with nearby Box Hill's promontory and chalk grassland slopes belong to the National Trust. Dorking is a commuter and retirement settlement with three railway stations and a few large offices of multinational companies. Similarly, Malden in 1911, noted the place was "almost entirely residential and agricultural, with some lime works on the chalk, though not so extensive as those in neighbouring parishes, a little brick-making, water-mills (corn) at Pixham Mill, and timber and saw-mills". Fine sand often in veins of pink, used for mortar and in glassmaking was dug, particularly in the 19th century — the Dorking Caves were accordingly excavated under southern parts of the town centre itself. Dorking chickens with short five-toed legs are a major local breed. The town has a local government headquarters and hosts repeating loops of the FIA-ranked London-Surrey cycle classic elite category event every year. Dorking began to become more than an agricultural village as a small staging post on Stane Street, the Roman road between London and Chichester on the English Channel. Dorking appears in Domesday Book of 1086 as the Manor of Dorchinges. It was held by William the Conqueror. Its Domesday assets were: one church, three mills worth 15s 4d, 16 ploughs, 3 acres (1.2 ha) of meadow, woodland and herbage for 88 hogs. It rendered £18 per year to its feudal system overlords. Subsequent Lords of the Manor included the Dukes of Norfolk, who lived in Dorking until they moved to Arundel. One of them is buried in Dorking churchyard. In the medieval period, Dorking was a prosperous agricultural and market town with businesses, including milling and brewing, capitalising on its position on the junction of a number of long distance roads and local tracks. In 1750, the construction of a turnpike road made Dorking a staging post on the route to Brighton and the coast. The Bull's Head in South Street had a famous coachman, William Broad, whose portrait hangs in Dorking Museum in West Street. An inn in the centre of Dorking, the White Horse, was developed in the 18th century; previous buildings on this site belonged to the Knights Templar and later the Knights of St John. Dorking held a big wheat and cattle market in the High Street. The poultry market was held in the corner of South Street and round Butter Hill. Here the famous Dorking fowl were sold. This breed, which has five claws instead of the normal four, was a favourite for 19th century tables, including that of Queen Victoria. Dorking lost its stagecoaches when the railways arrived, but then attracted wealthy residents who built large houses in and around the town, such as Denbies House and Pippbrook House (now with council offices in the grounds). Surrounding land and beauty spots such as Cotmandene and Box Hill were donated by landowners for public use, protected by the Metropolitan Green Belt and the AONB designation of the North Downs and Greensand Ridge. Cotmandene is a 4.78 ha (12-acre) area of common land to the east of the town centre, (the name is thought to mean the heath of the poor cottages). Cricket matches were played on the heath during the 18th century and are recorded in Edward Beavan's 1777 poem Box Hill. A painting entitled A Cricket Match on Cotmandene, Dorking by the artist James Canter, dating to around 1770, is now held by the Marylebone Cricket Club. A game resembling rugby was once played here. The two sides were unlimited in number, representing the east and west of the town. The goals were the two bridges on the Pipp Brook. The Town Crier kicked off the ball at 2 pm and stopped play at 6 pm. The game was started at the church gates and was "rioted" up and down the High Street. It ceased in 1897 after complaints by tradesmen and it was officially stopped under section 72 of the Highway Act 1835. Dorking was an urban district from 1894 to 1974. In 1911 it was described in the Victoria County History, compiled for the county that year and the next, as "almost entirely residential and agricultural, with some lime works on the chalk, though not so extensive as those in neighbouring parishes, a little brick-making, water-mills (corn) at Pixham Mill, and timber and saw-mills." The town is in the west of the area between hill ranges in southern England known as Holmesdale which has headwaters of several rivers. The town's geography is undulating; for example, the elevation of the southern point of the central one-way system is 76 metres (249 ft) and on its northern side the elevation is 59–60 metres (194–197 ft). The Mole's nearest point to the town lies at 45 metres (148 ft). Just northeast of the town the River Mole cuts a steep-sided valley through the North Downs. On the west bank is Denbies Vineyard, the largest vineyard in the UK. On the east bank is Box Hill, owned by the National Trust and Britain's first Country Park. The hill has been designated a Site of Special Scientific Interest, because of the large number of rare orchids which grow there in the summer. Further north is Norbury Park, which contains the Druids Grove, a forest of ancient yew trees. To the south west of the town is Leith Hill, also owned by the National Trust, the second highest point in the south east of England after Walbury Hill. The tower on the summit elevates the hill to 1,000 ft (300 m) above sea level. The area is towards the east of the Surrey Hills AONB surrounded by the Greensand Ridge, including Holmbury Hill and Pitch Hill, as well as the nearby escarpment of the North Downs from Box Hill to Newlands Corner. A species of fish-eating dinosaur, Baryonyx walkeri, was discovered in clay pits just south of Dorking. The creature had a long curved claw on each hand and remains of its last meal were discovered fossilised in its ribcage. The skeleton can be seen at the Natural History Museum in London. One disused clay pit (Inholms lane) is now open to the public as a nature reserve. Dorking experiences an oceanic climate (Köppen climate classification Cfb) similar to almost all of the United Kingdom. 'Let there be light', a decorative moulding above one of the shops in the High Street. Much of the original character survives, whilst accommodating businesses that serve the needs of the 21st century. The town is well known for its antique dealers. The town's three main trading streets of High Street, West Street and South Street are complemented by a small open-air shopping centre, St Martin's Walk, which is adjacent to the town's main car park and easily accessed from the High Street. In the late 1990s Dorking Halls was given a huge refit, to make it a cinema and theatre complex. In 2003 a new modern leisure centre and swimming pool were added to the Dorking Halls Complex. There is a thin, somewhat shiny metal statue of a Dorking cockerel on the Deepdene roundabout. Dorking and nearby Box Hill were chosen as part of the route for the 2012 London Olympics cycling road race and have featured in the FIA-ranked London-Surrey cycle classic and the Prudential RideLondon-Surrey 100 mass participation sportive every year since. A cycling statue was unveiled in July 2012 at the Pixham End roundabout on the A24 to commemorate the Olympic race passing through Dorking. In the mid-1960s the Goodwyns council estate was built at the south end of the town, adjacent to North Holmwood. The design of the terraced houses, three- and four-storey flats and twin eleven-storey tower blocks was praised by architectural historians Ian Nairn and Nikolaus Pevsner. The Deepdene Trail, a heritage walking trail, opened in 2016. People born in the town include: Laurence Olivier, Lord Olivier, in 1907 – a blue plaque marking his birthplace can be found in Wathen Road. Other people born in Dorking include Walter Dendy Sadler (1854–1923) artist and painter, and Oxford United F.C. Striker Jamie Mackie (born 1985). General Sir Lewis Halliday, a Victoria Cross recipient, died in Dorking. The composer Ralph Vaughan Williams lived in Dorking for much of his life, and penned in Dorking most of the works which made him famous. The lark in "The Lark Ascending" is known to have been heard in the Mole Valley to the north of the town. Absolute Radio DJ Christian O'Connell lived in Dorking with his wife and two children for several years until 2018. Actor Leslie Howard lived in a 16th-century farmhouse called Stowe Maries on the edge of Westcott, Surrey, just outside Dorking. Kenneth Baker served as Member of Parliament for Mole Valley from 1983 to 1997 and lived for most of that time in Betchworth. On retirement he was made a life peer and took the title 'Kenneth Baker, Baron Baker of Dorking'. People who have lived in the town in the past include: Daniel Defoe who attended Rev. James Fisher's boarding school in Pixham Lane, and Defoe later mentioned Dorking in his tour through the whole Island of Great Britain. Henry Hope and his nephew Thomas Hope spent summers at Deepdene in the beginning of the 19th century. Benjamin Disraeli wrote his novel Coningsby also while staying in Deepdene House (demolished in 1967) on the outskirts of the town. Emma Holland was brought up in the town. The Cubitt family also had links with the town. Thomas Cubitt was born and lived in the town, and later built up large areas of London from the early 19th century. His politician son George also had connections with the town, and notably financed the building of St Barnabas Church on Ranmore Hill known by its nickname of Cubitt's Spire, Cubitt's Finger or Cubitt's Stump. The English writer George Meredith and the Polish poet Marian Hemar are also buried at the local cemetery. Graham Gouldman and Eric Stewart of the band 10cc opened a studio, Strawberry Studios South, in a former cinema in Dorking at the end of South Street in 1976 following the departure of Kevin Godley and Lol Creme. Songs recorded here include "The Things We Do for Love" and "Good Morning Judge". Songs recorded here by other artists include "Ebony and Ivory" by Paul McCartney and Stevie Wonder. The building was later demolished and the site was used as a builders yard for a time; a housing development now occupies the site. In addition, The Cure recorded and mixed at Rhino Studios, which was at Pippbrook Mill, Fairfield Drive. Dorking is the administrative centre of Mole Valley District Council. It is in the Mole Valley parliamentary constituency. The town is twinned with Gouvieux, France since 1997 and negotiations began in 2007 to twin with the German town of Güglingen. Dorking is at the junction of the A24 (London to Worthing) and A25 (Maidstone to Guildford) roads. Dorking railway station, on the (north/south) Epsom to Horsham Sutton & Mole Valley Line. Services are run by Southern to London Victoria via Sutton. South Western Railway run services to London Waterloo. Dorking Deepdene, on the (west/east) Guildford to Redhill North Downs Line. Services are run by Great Western Railway. The above two stations are a short walk from one another, north of the town. Dorking West, also on the Guildford to Redhill North Downs Line, but with fewer trains stopping. Most bus services are run by Arriva, the main locations served being Guildford, Redhill and Reigate and villages in between, as well as some local services. Sunray Travel operates a Surrey CC supported route to Leatherhead and Epsom, and running via Box Hill. Metrobus took over Arriva's Horsham depot, and now run route 93 to Horsham, and London Buses route 465 to Kingston. Various primary schools cater for 5–11-year olds. Secondary education in the state sector is largely provided for by The Ashcombe School and The Priory School. The oldest primary school in Dorking is Powell-Corderoy Primary School. The school celebrated its 200th anniversary on 1 July 2016, having been founded (as Dorking British School) in 1816. On 15 June 2004, Dorking was granted Fairtrade Town status. The Dorking Halls is a cinema, theatre, leisure centre and swimming pool complex. There is also an "Arts Alive" Festival which takes place annually during the last two weeks of October. Dorking Halls is also yearly host to a professional pantomime which was re-introduced in December 2006, after several years of hosting Zippo's Circus. Dorking also has a museum, a library, about twenty pubs and a CIU affiliated club. It is noted for its antique and art shops on West Street. Dorking had two Non-League football clubs Dorking Football Club who played at county level until its liquidation in 2017 and were based in the centre of the town at the Meadowbank. Dorking Wanderers F.C. play in the Bostik League (Level 7) after 10 promotions in its 18 years of existence at the Dorking Wanderers Stadium, near Westhumble. However in November 2017 they are set to move into a £6 million ground built on the site of Meadowbank rather than their current out-of-town Westhumble ground. Dorking rugby football club, which plays at Brockham, attracted national attention when it won the Powergen Vase in 2005/2006 and continues to do so having won promotion from National League 3 (London & South East) to National League 2 South and Surrey Cup double in 2014. Dorking and Mole Valley Athletics Club is based at Pixham Sports Ground. They host the annual Dorking Ten road race starting from Brockham Green. Dorking also has a cycling club that meets on Sunday mornings at the Sports Centre in Reigate Road at 8:45, offering group rides for all abilities and cycling interests. Peter King CBE former Chief Executive of British Cycling is the Honorary President of Dorking Cycling Club. The Mole Valley Bowmen meet in the grounds of St Martin's primary school. Near to Dorking lies the Leith Hill escarpment of the Greensand Ridge, including the hills of Holmbury Hill and Pitch Hill, as well as the nearby escarpment of the North Downs from Box Hill to Newlands Corner. Both ridges are notable in southern England for country walks, rambling and mountain biking, and the town in one of the narrowest gaps between high parts of them has a number of premises catering to these pursuits. Part of the 'Vale of Holmesdale', much of the post town but not town itself is within the Surrey Hills AONB. Also adjacent to Dorking is Denbies Vineyard. The Dorking Group of Artists exhibit locally twice a year, in Betchworth and at Denbies. They celebrated their 60th anniversary in 2007. Underneath part of the town centre are the Dorking Caves which are open occasionally to the public and were dug for sand, mostly in the 19th century. Each year in April, the town plays host to the Leith Hill Musical Festival for local choral societies. This was founded in 1905 by Margaret Vaughan Williams, sister of the composer Ralph Vaughan Williams, and Lady (Evangeline) Farrer, wife of Lord Farrer of Abinger Hall. Ralph Vaughan Williams was the Festival Conductor from 1905 to 1953. The present Festival Conductor is Brian Kay. The festival is competitive lasting three days, each day with a different division of choirs; each evening the choirs who have competed during the day combine to give a concert of the works which form the subject of the competitions. Following the tradition established by Vaughan Williams, the St. Matthew Passion or the St. John Passion of J. S. Bach are also frequently performed by the combined choral societies. After the death of Vaughan Williams in 1958 the festival committee commissioned, from David McFall A.R.A., two identical bronze plaques with a likeness of the composer; one was placed in St. Martin's church and one in the Dorking Halls. In 2001 a smaller than life size bronze statue of Vaughan Williams by William Fawke was erected outside the Dorking Halls. The Battle of Dorking, a novella written by Lt. Col. Sir George Tomkyns Chesney in 1871, was set in the town. Describing a fictional invasion and conquest of Britain by a German-speaking country, it triggered an explosion of what came to be known as invasion literature. In groupings by such bodies as Surrey County Council, the unparished area in terms of civil parishes in England, North Holmwood is grouped with Dorking, and is subsidiary to the town as lacking many amenities and services. However, as with Westcott, neighbouring settlements with their own church and a degree of physical divide (a hill and fields respectively) are considered separately. ^ a b "UK Grid Reference Finder". UK Grid Reference Finder. Retrieved 29 April 2012. ^ "List of Recreation Areas and Parks". Mole Valley Borough Council. ^ "The Cotmandene, Chart Lane, Dorking". Retrieved 7 August 2013. ^ Timms, John (1822). A Picturesque Promenade Round Dorking, in Surrey. London: John Warren. p. 96. ^ Beavan, E (1777). Box Hill, a descriptive poem. London: Wilkie. ^ "Howzat". Dorking Museum and Heritage Centre. Retrieved 7 August 2013. ^ "Description of Dorking from Local Authority". Mole Valley Borough Council. ^ Guy Martin (28 May 2012). "Dorking cockerel gets in Diamond Jubilee spirit". Get Surrey. Retrieved 26 June 2012. ^ "Prudential RideLondon-Surrey 100". www.prudentialridelondon.co.uk. Retrieved 25 November 2018. ^ "Geograph:: Pixham End Roundabout cycling statue [7 photos] in TQ170508". www.geograph.org.uk. Retrieved 25 November 2018. ^ Nairn & Pevsner 1971, p. 198. ^ "The Deepdene Trail". Mole Valley District Council. Retrieved 11 August 2016. ^ "Powell Corderoy History". Retrieved 14 July 2016. ^ "Leith Hill Music Festival". Retrieved 14 November 2010. Wikimedia Commons has media related to Dorking. Surrey County Council. "Dorking". Exploring Surrey's Past. Retrieved 30 December 2017.